It's here in distinctive new Wide-Screen Grille and chrome-capped headlamp -- there in dramatic new sweptback tail light -- inside with modern decor and new tri-spoked steering wheel -- everywhere in low-lined, lithe, new fashion. 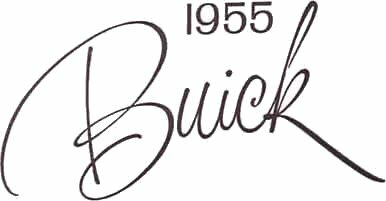 Here in Buick for 1955 is the style leadership of today and tomorrow -- and the thrilling beauty buy for you. With the new Full-Skirt Slotted Pistons and freer-breathing design of the 1955 V8 engine, Buick continues its never-ending advance in power and performance in every Series. ROADMASTER, SUPER and CENTURY hit a new high of 236 horsepower, the SPECIAL -- 188 horsepower. 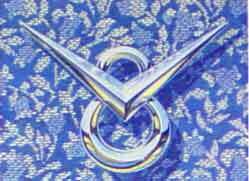 Compression ratios are as high as 9.0 to 1 --a record for Buick and the industry. And thanks to the V8's increased power efficiency and higher compression plus the new cruising economy of Variable Pitch Dynaflow, the1955 Buick averages up to 4.8 miles more per gallon than Buick's of six years ago! What the variable pitch propeller does for aircraft take-off and climb, this new transmission does for Buick getaway and acceleration. It gives spectacular performance. It gives greater economy. Inside a 1955 Dynaflow unit, twenty propeller-like blades change their pitch in oil like a modern plane's propellers change their pitch in air. One pitch is for swift take-off, the other for economical cruising. So when you want instant getaway from a standstill--or far more important, when you want to make a quick pass in a short distance -- you simply press the accelerator to the floor board. And you're away in a safety-surge of power. Then, when you're back in lane, ease up on the accelerator and Variable Pitch Dynaflow resumes traveling in its new gas-saving cruising range. The limitless thrills of Variable Pitch Dynaflow can be known only be experience. There has never been anything like it before. 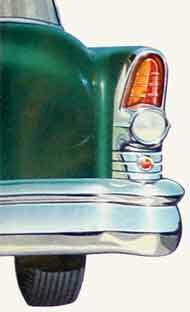 Standard on ROADMASTER, optional at extra cost in all other Series.